Okay, I’ll be the first to admit it. I’m an overprotective parent. I have a tendency to overdo it and obsess over the little things that don’t really matter. I guess that’s why I was intrigued by this week’s (November 2009) cover of TIME magazine entitled: The Case Against Over-Parenting: Why Mom and Dad Need to Cut the Strings. The insanity crept up on us slowly: we just wanted the best for our kids. The problem is that we are afraid. If our greatest aim as parents is to protect our children and prepare them to receive some kind of academic or athletic recognition, than most likely we are parenting out of fear. Why? Because deep down we’re scared if they don’t succeed. We feel like we’ve failed as parents. So we work hard to prepare our children to make the grade or make the team so we would look good. It’s like our children are little trophies that we, as Paul Tripp says, “secretly want to display on the mantels of our lives as visible testimonies to a job well done” (Age of Opportunity, p. 35). It must be difficult to sum up a topic like this in a short article, but as much as I enjoyed the beginning of your article, I feel you went off and stereo-typed the "Why' we may protect (or as you write in your article, over-protect) our children. The fear you speak of is not because we feel it is a reflection of us and or a trophy for our mantle if they do well, but that this world, with its many diversions, temptations and pitfalls require a certain level of success to actually survive. We are not afraid they will fail and therefore make us look bad, but that they will suffer in areas that we could have guided them around and yes, allowed them to fail in while they are young enough to correct – whether that is performance or behavior. I do not disagree that there are parents as you mentioned, but the article suggests that this is the norm for both secular and Christian parents and I disagree. Parents on both side of that fence have real fears about our society and what it takes to make a decent living, live moral lives in our families and communities and succeed wherever that may be that God leads them, but not for our (parents) own personal gain or how we measure up to others, but for the sake of our children who will have to succeed in a world that is much different than when you or I left home and went to make it on our own. We do need to make sure we are not hovering excessively and let them fail and then suffer the consequences of that failure. I think you make good points in your article and appreciate you sharing them but feel that some of your conclusions are too narrow and maybe that is because of the little space you had to write them. @Anonymous, I did not write the article, FYI. Thanks for your comment! 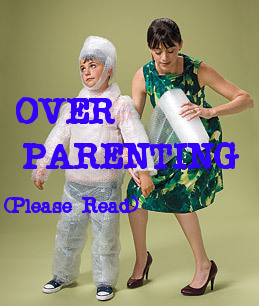 There are some things worth being "extra" protective about as parents. The movie "Come What May" is a great lesson in turning out a well-rounded and grounded young person by proper protective methods.